Duke Endowment; and John H. Frank of the Kate B.
Bridges, Henderson County health director. Three people have been awarded the 2008 Ronald H. Levine Legacy Award for Public Health in recognition of their many contributions to public health on the local, state and national levels. 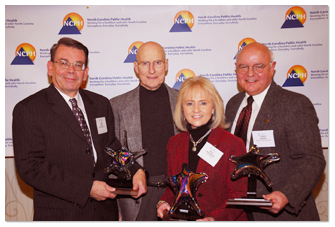 One local health director and representatives of two philanthropic agencies received the awards at the 2008 State Health Director’s Conference in Raleigh on Jan. 25. Dr. Leah Devlin, State Health Director, presented the awards to Thomas D. Bridges, Henderson County health director; Mary L. Piepenbring of The Duke Endowment; and John H. Frank of the Kate B. Reynolds Charitable Trust. “North Carolina is fortunate to have these dynamic leaders in private philanthropy and local public health making these significant contributions to health in our state,” Devlin said. Named for former North Carolina State Health Director Dr. Ron Levine, the award honors individuals whose life work on behalf of the public’s health have resulted in significant, sustainable and positive improvements in North Carolina’s public health system. Bridges, who received the Levine Legacy Award for Local Innovation, has been director of the Henderson County Department of Public Health for the last nine years, after serving for five and a half years as health director in Person County. During his tenure as a local health director, Bridges has played a key role in establishing a regional coalition among local hospitals and health departments. Continually seeking more effective ways to serve the community, he frequently volunteers his agency as a pilot site for new ideas, initiatives and systems. In various leadership roles in the N.C. Association of Local Health Directors, he has led the way in advancing technology for local health agencies, such as improved health data systems and access to the Public Health Training and Information Network, which brings interactive public health teleconferences and training opportunities to convenient sites across the state. Bridges also has key roles in the Region 6 Public Health Regional Surveillance Team (PHRST); Western Partnership for Health; N.C. Public Health Executive Committee and Governing Council; Henderson County Partnership for Health, Inc.; and N.C. Center on Health and Aging, and is a member of the Henderson County Council of Aging. Before becoming a health director, Bridges was a long-time director of Nutrition Services at the Craven County Health Department. He has also worked as a laboratory technician in hospitals and at the University of North Carolina School of Public Health. Two Levine Legacy Awards for Statewide Impact recognized the work of Franks and Piepenbring and their respective charitable organizations. Frank was a career hospital administrator before becoming director of the Health Care Division of the Kate B. Reynolds Charitable Trust in 1995, serving in hospitals in Alamance and Davie counties as well as in Lexington and Charlotte. He is currently a member of the Governor’s appointed N.C. Institute of Medicine; serves on the N.C. Public Health Task Force; is a research fellow with the Cecil G. Sheps Center for Health Services Research at the University of North Carolina; serves on the Governor’s Taskforce for Health Carolinians; and is on the Board of Directors of Lumiere Medical Ministries in Haiti. Frank and the Kate B. Reynolds Trust were recognized for major grant and funding programs related to public health and community health, including Healthy Carolinians Partnerships serving 83 N.C. counties; N.C. Schools for Physical Education Programs; and multiple programs supporting child immunizations, community-based public dental clinics, HIV prevention, nutrition, and chronic disease prevention. In addition, since 2001 the Health Care Division of the Trust has invested $10 million dollars in the five-year Project SELF (Smoking Education Lifestyle Fitness) Improvement, the largest and longest, single commitment the Trust has made throughout its history. Piepenbring is director of the Health Care Division of The Duke Endowment, a Charlotte-based private philanthropic foundation. A licensed social worker, she has worked in various positions in hospital administration in North Carolina and South Carolina and held the position of vice president in administration for seven years at the Carolina HealthCare System in Charlotte prior to joining The Duke Endowment in 2000. Piepenbring and the Endowment were recognized for their support of the N.C. Child Maltreatment Initiative, the Care + Share Initiative, programs addressing childhood obesity, and the Health Network for the Medically Uninsured, as well as improving access to quality dental care, providing funding support to small and rural hospitals, and giving $1 million in flood relief grants to North Carolina communities. Piepenbring serves in leadership positions with the N.C. Medical Care Commission, the Center for Hospital Quality and Patient Safety, and the Carolinas Specialty Hospital, and is a Hull Leadership Fellow with the Southeastern Council of Foundations.